In the end, it was more about France than Britain. President Emmanuel Macron stuck to his guns at last night’s summit, arguing that giving the U.K. a Brexit delay until the end of the year or longer — as most EU leaders wanted — would do nothing to keep pressure on the British Parliament. While diplomats spoke of anger at Macron’s intransigence, a compromise was eventually found that’s more generous than France’s initial offer of an extension only until June 30. The U.K. will now stay in until Oct. 31 — unless Parliament passes the deal before then. And so the focus now shifts to London once again. Trade Talks | European Trade Commissioner Cecilia Malmstrom may get today what was withheld from her last week: the go-ahead from EU ambassadors for talks with the U.S. on cutting industrial tariffs. The bloc’s envoys will scrutinize a draft negotiating mandate that has been tweaked to address demands by France, whose support is deemed key even though the country lacks veto power over the decision. Democratic Ruling | Poland’s clash with the EU over the rule of law will occupy the bloc’s judges again today. The European Court of Justice will issue a non-binding opinion on the legality of Poland’s decision to lower the retirement age of top court justices, part of the sweeping judicial reforms that the government in Warsaw argues Brussels has no jurisdiction over. Latvian Affair | The ECJ will also give a non-binding opinion in the European Central Bank’s dispute with Latvia’s Trasta Komercbanka, the lender shut down after money-laundering allegations. The case is a bid by the ECB to overturn a challenge by the bank against the 2016 decision to withdraw its license. Middle-Class Troubles | There’s a trend shaking the foundations of the world’s richest economies: middle-class life is unfair, expensive and uncertain. According to the OECD, its share of total income is falling, while costs for housing, education and health care surge. Over-indebtedness is higher, and the risks of tumbling down the social ladder are increasing as automation and the changing nature of work threaten jobs. ECB Unchanged | ECB officials reiterated their pledge to keep interest rates at record lows, giving themselves time to assess prospects for the euro area’s weakened economy as it confronts new risks. Mario Draghi, meanwhile, signaled that the central bank expects to rely on long-term bank loans and tweaks to its negative interest-rate policy as a first defense against the economic slowdown. Black Hole | You thought Brexit was complicated? Scientists yesterday revealed the first-ever glimpse of a super-massive black hole in a “ground-breaking” discovery that opens up more questions to explore. That’s because the two big theories that describe the universe — quantum physics and general relativity — break down at the edge of black holes. Prosecutor Politics | Negotiations to appoint the EU’s first chief prosecutor were suspended indefinitely after the bloc’s Parliament canceled the latest round of talks. The move ends the work of a team of lawmakers tasked with fighting for the candidacy of Laura Codruta Kovesi, who was fired by Romania’s ruling Socialist Democrats after she put dozens of corrupt politicians behind bars. Cloud Threat | The finance industry’s dependence on a handful of large cloud computing companies to store key data is an emerging threat to financial stability, according to a report by three EU watchdogs. The regulators said Brussels should consider creating a new oversight system for cloud-computing services that are critical to financial firms. 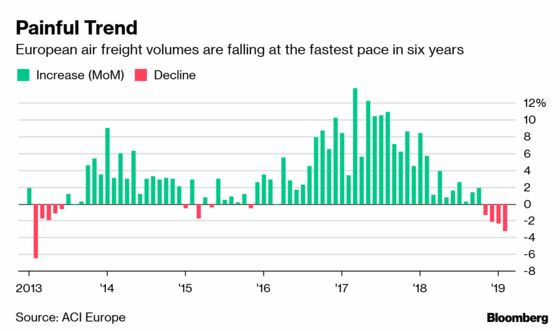 Air-freight movements in Europe are declining at the fastest pace in six years, joining a host of indicators that have raised concern about the economic outlook. At airports in the region, air-cargo volumes fell 3.3 percent in February, data by Airports Council International Europe show. That’s the fourth consecutive decline and the worst reading since 2013.